The 2016 Six Nations campaign kicked off a new four year cycle that will culminate in the 2019 Rugby World Cup in Japan and the Northern Hemisphere teams will be hoping they can bridge the quality gap between themselves and their Southern counterparts. England have more to prove than anyone and every decision by the management has been under scrutiny. First the appointment of Eddie Jones, upsetting a few traditionalists who lamented employing a foreigner, but who was put in place to create a winning side. Then Jones’ decision to make Dylan Hartley captain which was met with varying reactions, from delight that England would have a strong leader that wouldn’t tale a backward step, to dismay and even horror at the kind of example being set of appointing someone with such a poor disciplinary record. I even had a demand that the RFU Council should hold an emergency meeting to remove Hartley from the captaincy before the tournament started. During a conversation with a reporter from a national paper that I know socially, we talked about the reaction to Hartley’s appointment and he made the interesting comment that the media see him off the field where he is a different character and as a result they perhaps give him more sympathy than the public. On the night before the game I was at a dinner with the RFU and Scottish Rugby Union committees where the talk was about what we expected to happen the next day. 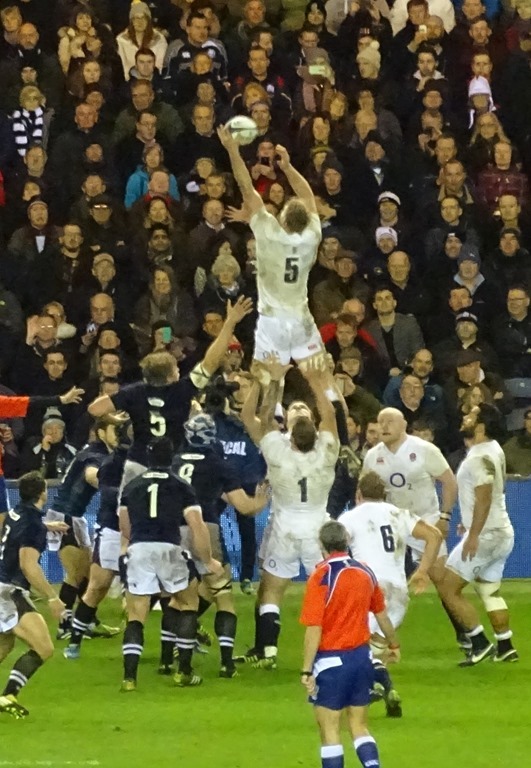 The general consensus was that England had the better players, most of the World Cup squad has been retained but there were some positional changes, while Scotland had the unquantifiable advantage of a passionate home crowd and the determination to bounce back from the perceived injustice of the loss against Australia in the RWC quarter-final. Prior to the dinner I had a wander around the city and a couple of pints with people from West Norfolk RFC and Brightlingsea RFC. This is the joy of the Six Nations, meeting up with friends some of whom you only see at England games. For instance on the Saturday morning I met up with my old friend Kath Vass, a former SRU Council member and prop who in the past played at Eton Manor. 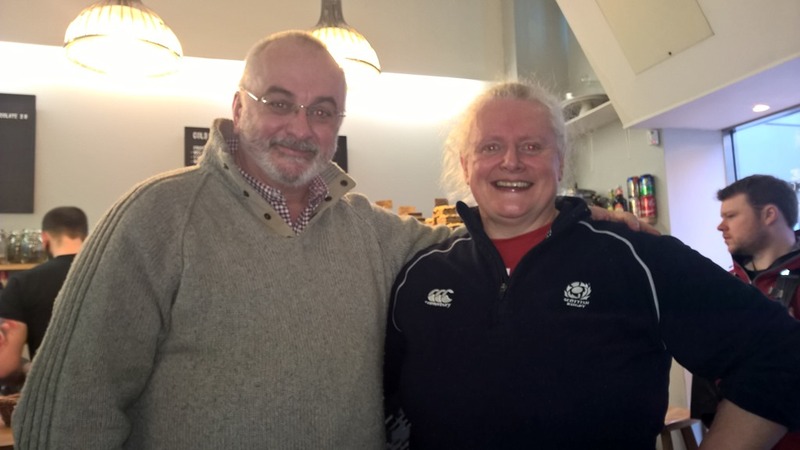 Like me she has some Polish parentage and works in the NHS so we have a lot in common and it is always good to catch up with her either in Edinburgh or at Twickenham. Soon it was time to get on the coach to Murrayfield and enjoy the hospitality of the SRU. 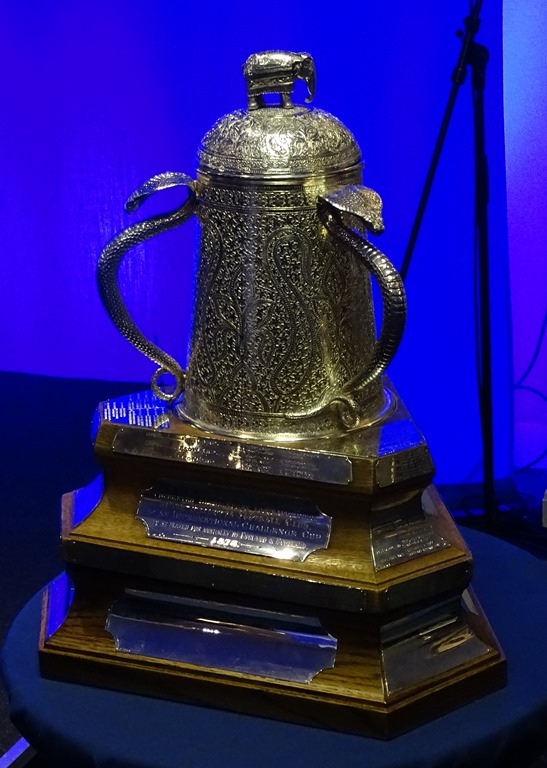 As we entered the function room where the Calcutta Cup was on display I was offered some Crabbie’s ginger beer which I hadn’t had before. It is similar to Pimm’s in that it does taste as though there is no alcohol in it and as a result it is easy to keep knocking it back with realising the effect it is having on you. As we helped ourselves to bowls of food, including the invariable haggis, tatties and neeps, we watched the France v Italy game on the TVs in the room and we were as disappointed as anyone to see the Italians go down. Princess Anne arrived as she does for every Scotland v England game and soon it was time to take our seats in the stadium. This was my fourth visit to Murrayfield and despite what I said about the passion of the crowd, I felt that it was a little more subdued than usual. Flower of Scotland was belted out but the nationalist fervour of previous years didn’t seem to be there. The piper on the roof had gone and there was much less pre-match entertainment than in previous years. When the game started is wasn’t long until the English supporters started singing Swing Low which was greeted by the usual whistles and jeers, just as it is in Cardiff and Dublin. What was surprising was that the song wasn’t completely drowned out and you could still hear it despite the best efforts of the Scots. This continued throughout the game although I’m not sure is that came through on the TV. When it came to trying to put off Owen Farrell when kicking for goal however, the home support didn’t hold back with their whistling. I had hoped that this was something that all the home nations would be trying to discourage and although the screens displayed messages asking everyone to respect the kicker, there was no announcement asking the crowd to remain silent. What was more disappointing was that the English supporters then reciprocated trying to put off Greig Laidlaw during the second half having remained respectful during the first. England can be satisfied with the 15-9 win and more so having scored two tries to none. The biggest difference between the sides was the quality of the bench although I liked having two playmakers at 10 and 12, getting away from the inside centre taking the ball into contact as the default. It wasn’t a perfect performance by any means but the job was done and the team will develop week by week. After the game there was the traditional sit down dinner with all the players attending. I was sat next to the Scottish team and I was surprised to see how small Greig Laidlaw is, proving that with talent and the correct skill set, Rugby Union is a game for all shapes and sizes. First to speak was SRU President Ed Crozier whom I have got to know over the past few years. He started off by saying that he and RFU President Jason Leonard have 114 international caps between them; Jason has 114 and he has none. 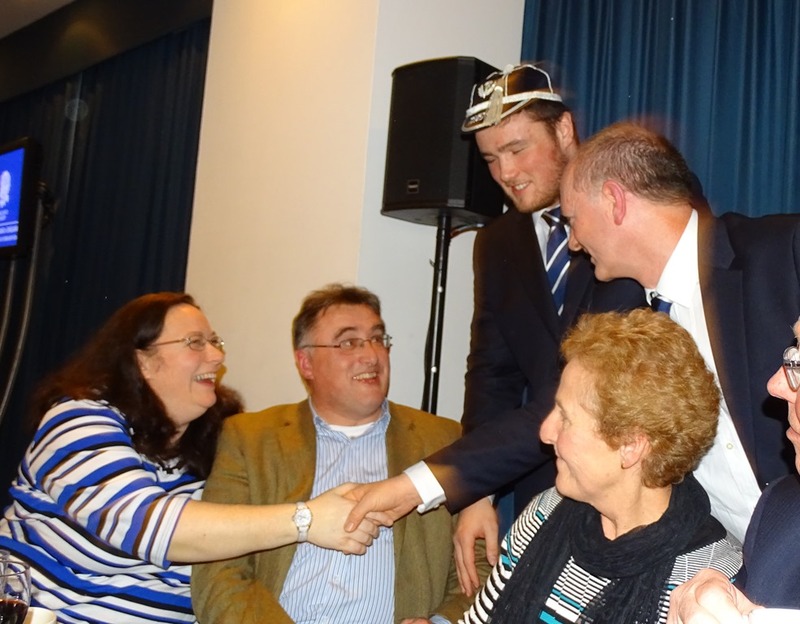 As is traditional players making their international debut receive their cap at the dinner and for Scotland it was 20 year old Zander Fagerson. A nice touch was inviting his parents up to the podium to receive it with him to recognise the years of support and sacrifice they had given to get their son to this level. There are still four games to go but already only England or France can win the Grand Slam and only England can win the Triple Crown. Next stop is Rome where a win is expected but the manner in which they do it will be under close scrutiny. And at grass roots, a good weekend for Diss, Crusaders and Ely who now carry the Eastern Counties flag into the next round of RFU Cup competitions, although both Crusaders and Ely teams are having to check passports are up to date!